The U.S. Pacific Remote Island Area (PRIA) includes seven islands, atolls and reefs in the Central Pacific that are under the jurisdiction of the United States. 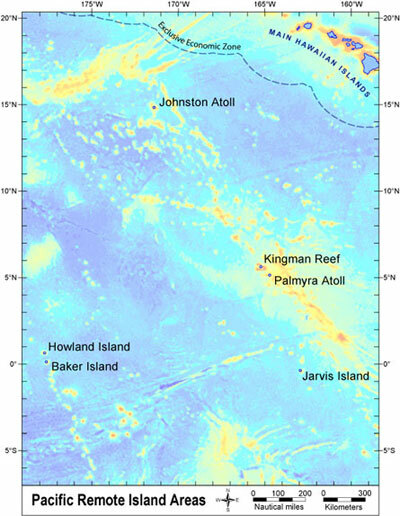 Baker, Howland and Jarvis islands, Johnston Atoll, Palmyra Atoll (owned by the Nature Conservancy), and Kingman Reef lie between Hawai‘i and American Samoa . Wake Island is located between the Northwestern Hawaiian Islands and Guam. Wake is an unincorporated territory of the U.S. that is administered by the Department of the Interior (DOI) and the U.S. Air Force. All except Wake and Johnston are administered asNational Wildlife Refuges (NWR) by the U.S. Fish and Wildlife Service (USFWS) of the Department of the Interior (DOI). Johnston Atoll is managed by the Department of Defense (DOD). Wake Island (or Wake Atoll) is under the jurisdiction of DOI, and managed by DOD. Some include Rose Atoll (the easternmost of the Samoan Islands) and Midway Atoll (located near the northern end of the Northwestern Hawaiian Islands) among the PRIAs. The U.S. claimed most of these uninhabited islands under the Guano Act of 1856. In the absence of human activities, the coral reef ecosystems of the PRIAs remained undisturbed until the early 20th century. During World War II, the U.S. constructed and occupied military bases at Johnston, Palmyra, Wake, Midway, and Baker. Jarvis and Howland were also briefly occupied or utilized during the war. With the closure of the military base at Johnston Atoll in 2004, only Wake Island remains an active U.S. military base. Even today, all the PRIAs have escaped coral reef ecosystem degradation caused by coastal development, associated pollutants, and major shipping lanes. Public entry to the islands is by special-use permit from the USFWS only and generally restricted to scientists and educators. Only Midway Atoll and Palmyra Atoll have serviceable runways; Baker Island, Howland Island, and Johnston no longer have functional airstrips. 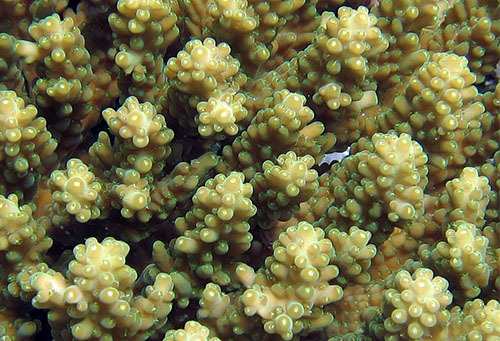 A close-up of A. retusa which can be found in U.S. Pacific Coral Reef Jurisdictions. Copyright Douglas Fenner. The State of Coral Reef Ecosystems of the United States and Pacific Freely Associated States: 2008. The State of Coral Reef Ecosystems of the United States and Pacific Freely Associated States: 2005. The State of Coral Reef Ecosystems of the United States and Pacific Freely Associated States: 2002. Search the CoRIS Geoportal for U.S. Pacific Remote Island Areas (PRIAS) metadata, data and publications. You may also enter the name of any atoll, island or reef in the CoRIS Geoportal search box and press the "Search" button. 1890000 Wake Island, Pacific Ocean, Possession of the U.S.